In recent years—especially in the time since EPA fuel economy ratings have become more realistic—40 miles per gallon on the highway has become like a sort of high-water mark for non-hybrid cars. Even in 2014, there remain relatively few subcompact or compact sedans that top the 40-mpg mark in ratings, let alone real-world use. So it's all the more surprising—and delightful—that a big, comfortable luxury sedan like the Mercedes-Benz E-Class can top 40 mpg, easily. 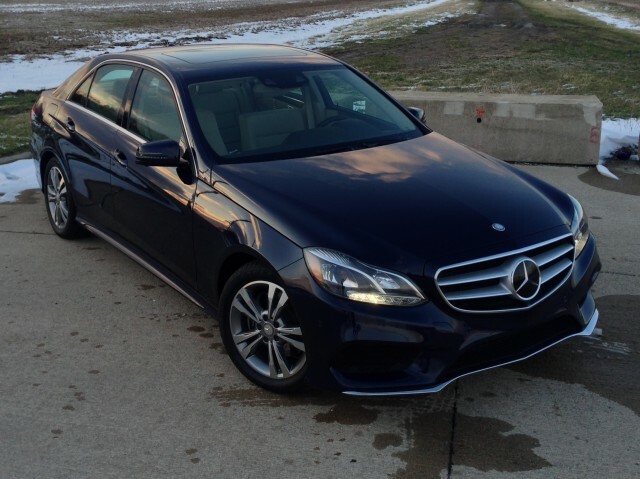 That's what we found this past week, with a drive of the 2014 Mercedes-Benz E250 BlueTec. Even when optioned with the 4Matic all-wheel drive system, our test car carried EPA ratings of 27 mpg city, 42 highway (from 28/45 mpg with rear-wheel drive). We appreciated the all-wheel-drive confidence for the scattered slippery spots (and 28-degree temperature) the night we arrived back in Michigan. And for the rest of the time, we traveled much of our distance with the flow of traffic at MI expressway speeds—which could have often been considerably higher than the 70-mph posted limits—so we sure didn't expect to get within 1 mpg of the E250 BlueTec's 42-mpg highway rating. 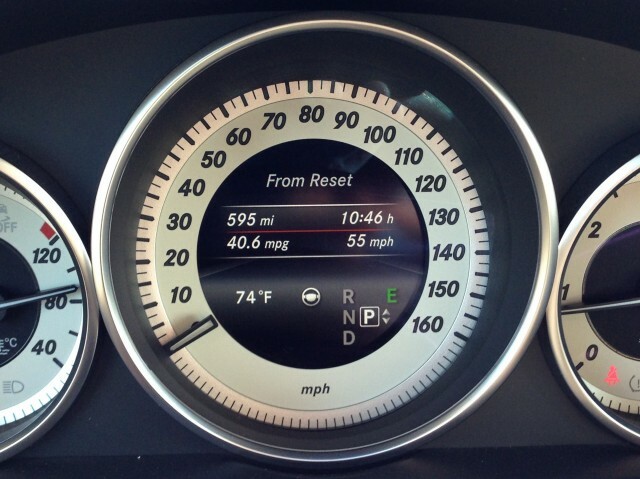 But by the end of our five days with the E250 BlueTec, we'd averaged an indicated 40.6-mpg over 595 miles. At that time, the instrument display was still showing a remaining range of 235 miles—so from the 21.1-gallon tank a total driving range of more than 800 miles would be within a real-world (non-hypermiling) reality. Instead of the former 3.0-liter turbo-diesel V-6, there's a 2.1-liter turbo-diesel four-cylinder engine. And from startup to highway passing, you might not ever even notice that it's using two fewer cylinders than last year's E-Class diesel (or the less efficient V-6 TDI in several Audi models like the A6); it's that strong and that smooth. As we observed in a first drive last summer, this engine makes a modest 195 hp, but it's the 369 pound-feet of torque that says it all—allowing the seven-speed automatic transmission to ratchet off smooth shifts and keep revs low while the diesel engine accelerates quite briskly, at relatively low revs. The E250 BlueTec also includes engine stop/start, which shuts off the engine for up to a few minutes at a time when you're waiting at stoplights or stopped with traffic. You feel the engine as it's stopped (a faint shudder) much more than as it's restarted, and you're never left waiting for a restart because the system tends to restart the engine pre-emptively, at the moment you lift your pressure somewhat from the brake. Our test E-Class had the Sport appearance package, which does away with the traditional hood ornament and more formal grille, as well as the entire suite of active-safety features—including Distronic with Steering Assist, which uses cameras and radar sensors to actually steer the car and keep within marked lanes for short distances. By the time we left Michigan, temperatures had swung to another extreme for the season—to the upper 70s and prompting the A/C. In any case, we didn't spare any comfort in the E-Class; and that's one of the key points in emphasizing how impressed we are with this efficient sedan. Hybrid models typically require hyper vigilance, if not hypermiling—monitoring climate-control use and keeping speed as low as possible if you want to meet mileage ratings. And we'll even say the same about some of the gasoline compact sedans on the market with highway ratings that approach 40 mpg. But the E-Class BlueTec, as most diesels, doesn't require such restraint, and it can arguably do just as well as a Prius at faster highway speeds. Yet going, say, 75 mph instead of 65 mph in the E250 BlueTec seemed to have little to no negative effect; it's still in its sweet spot. There's one issue here with this BlueTec and any turbo-diesel car, truck, or crossover, and that's the persistently high cost of diesel in the U.S. Where we filled (a BP station in Michigan), ultra-low-sulfur passenger-car diesel was $4.15 a gallon—15 cents a gallon more than top-grade gasoline and 42 cents (11 percent) more a gallon than regular-grade. Luckily, the E250 delivers more than enough of an improvement in mileage over the gasoline E350 to justify the higher cost per gallon. And the E250 BlueTec is actually the low-priced entry point for the E-Class lineup; truth be told, however, our optioned E250 BlueTec totaled around $64k. We'll agree that a hybrid choice like the Prius, or more appropriately the Lexus ES 300h, might be a better pick if you only do city driving and short trips. But for long-haul highway travel, as well as the sort of longer-distance commuting that's typical for Americans in larger cities, you really can't beat a diesel like this BlueTec.